I was at the Mill City farmers market in downtown Minneapolis a few weeks back and tried Pickled Brussels Sprouts for the first time. Very nummy! They would make a great addition to any Thanksgiving relish tray. Clean and wash brussels sprouts (cut larger sprouts in half). In a large-sized, non-reactive pot, combine water, vinegar, and salt. Bring to a boil. Divide remaining ingredients between 2 (hot, sterilized) pint jars. 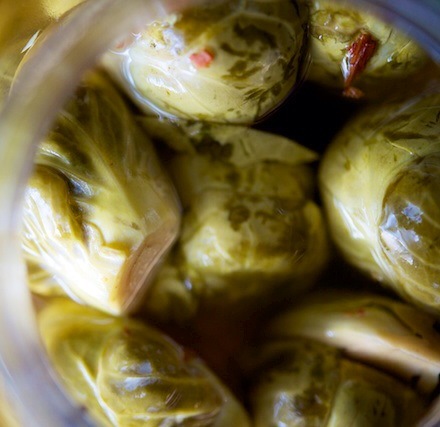 Tightly pack brussels sprouts into jars leaving approximately an inch head space. Pour hot brine over sprouts, leaving 1/2 inch headspace. Wipe rims, apply lids and rings (finger tight). Process in a hot water bath for 10 minutes. Remove from heat, let jars sit in canner for an additional 5 minutes to prevent syphoning. Remove from canner, let cool for 12-24 hours on a folded towel on the counter top. Let set in a dry and cool place for at least 2 weeks before consuming.